Chosen as the Army and Navy Club's Book of the Month for March 2016 and shortlisted for the Anderson Medal awarded by the Society for Nautical Research annually. You'll be £50.00 closer to your next £10.00 credit when you purchase The British Battleship. What's this? Order within the next 8 hours, 38 minutes to get your order processed the next working day! The publications of Norman Friedman, as usual, never leave anyone indifferent. This is a standard work that may succeed worldwide. Packed full of information and with some interesting conclusions based on the research information. An excellent reference on the Royal Navy battleship, and much more than simply telling their individual histories. The author has drawn material from his years of research at the National Maritime Museum's archive at Woolwich, the 'Brass Foundry' and the National Archive at Kew. For those unable to visit either location this book represents a mastery of the ships' covers, drawings, contructors' notes and Admiralty files. The 'British Battleship' is a major new contribution to the subject that every enthusiast will certainly want to own. 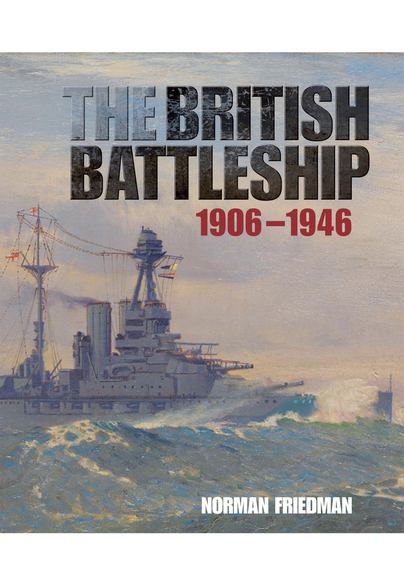 The Dreadnought battleship famously outclassed all existing battleships in 1906 making them obsolete and this superb book on British battleships outclasses all other books on British battleships, and there are many of them. This book must become the standard reference book on British battleships of that period, standing alongside R A Burt and Oscar Parkes great classic works. It benefits from modern publishing techniques with fold out coloured centre folds of battleship technical 'covers' and a great host of quality photographs, plans and drawings many drawn by A D Baker III and John Roberts. It also benefits from Friedman's prodigious knowledge and extensive research carried out over many years giving him a commanding position in the area of 20th century naval history. The scene is set, as in many of Friedman's books with an excellent introduction; I hope one day he will publish them all in a special omnibus edition, and this is followed by the technical background. He rightly devotes a couple of chapters to Fisher and then Dreadnought revolution and includes the introduction of Fisher's special innovative dreadnought faster sister, the controversial battlecruiser. He covers the development of the dreadnoughts during the Naval Arms race with Germany leading up to the First World War as well as British battleships built for the export market, relevant as later they were mostly commandeered to serve with the Grand Fleet. The chapters on war construction and the war are brief and mostly confined to solving the problems of operational requirements and battle experience. He points out that at the beginning of the war it was assumed that it would be short and so capital ship construction seemed pointless, but whilst it was easy to cancel orders in the Royal Dockyards this was not so in the private yards. Incidentally, it is surprising to note that just before Jutland, Jellicoe wanted more battlecruisers rather than battleships. The reduction and modernisation of the battleships during the interwar years is well covered, leading up to a brief chapter on WWII, before finally 'The end of the Battleship Era'. It is a big size book, sumptuously produced by Seaforth and I have no hesitation in giving this excellent book a top five star recommendation. As might be expected from the author's reputation, the work is based on extremely thorough research, notably in the Ships Covers and other Directorate of Naval Construction records held by the National Maritime Museum at the Brass Foundry, Woolwich. The result is a very comprehensive analysis that explains, in great detail, the decision-making processes which led to the successive classes of ship and their service development. A great book and a worthy addition to any Naval library. The British Battleship is full of original insight based on an incredible amount of data gathered over decades of research into primary material, not all of which was available to previous authors. It adds significantly to contemporary knowledge of the subject and I am sure that every battleship enthusiast and naval historian with an interest in the period in question will want to own a copy. It certainly has an honoured place on my bookshelf and I thoroughly recommend it to fellow ANI members. This eagerly-awaited book follows Seaforth Publishing's familiar large format, allowing the inclusion of big drawings and photographs to complement the text... The photographs have detailed captions, all are well chosen and many have never, previously been published... The British Battleship is a major new contribution to the subject that every enthusiast will certainly want to own; my copy now has a valued place on my bookshelf and I wholeheartedly recommend it.